The world needs a hero and our Feast Taytay youth campers need heroes like you, too! 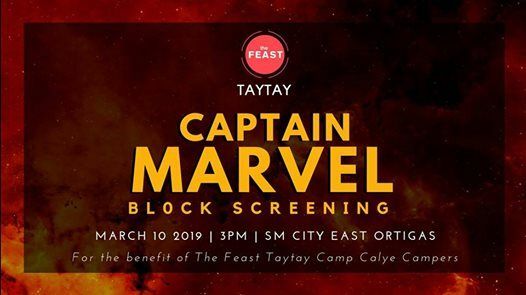 Catch the most-awaited superhero film, CAPTAIN MARVEL, with the whole Feast Taytay community on March 10 2019, 3PM at SM City East Ortigas Cinema 1. Proceeds of this fundraising project will help subsidize our Feast Taytay Youth Ministry's Camp Calye fees and their other camp needs. 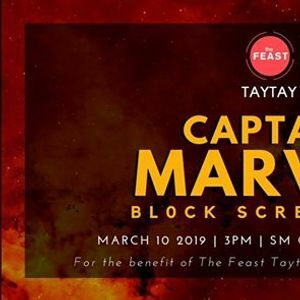 For more information and for ticket reservation, you may message us here on Facebook or call/text The Feast Taytay Secretariat Ministry at 0998-5382583.